Eco-friendly Ganpati Decoration Workshops for Students. Grand start of workshop for 50 students from schools like R.M. Bhatt School; Dr. Shirodkar School; Bal Mohan Vidhyamandir & Ahilya Vidhyamandir. Students were happy and enthusiastic while this workshop was processed. 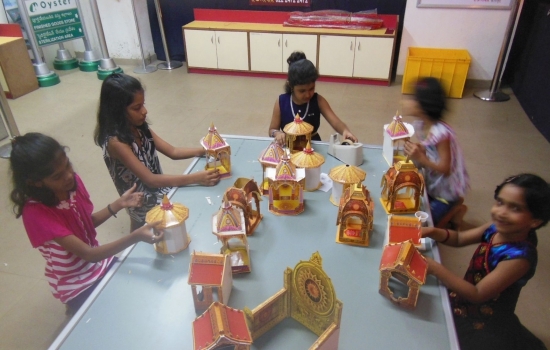 They expressed their love for art by actively participating and assembling the Makhars ( Eco-friendly Decorations). It was successfully hosted by Shri Nanasaheb Shendkar and his Utsavi team at Prabha Kutir, Ganesh Galli, Lalbaug, Mumbai-12.